This guide contains a general description of geospatial resources available in Atlas and Map Collection and in other collections in the Library, along with guidance in how to best search for geospatial resources in these collections. GIS and Digital Spatial Data is a complementary research guide that selectively lists Internet and print resources by broad subject category, e.g. soil maps; or by geographic area, e.g. California. 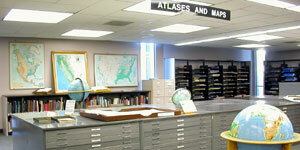 The Atlas and Map Collection is located in the southwest corner of the first floor of the HSU Library at approximately 40° 52' 36"N, 124° 04' 49"W (WGS84/NAD83); UTM 10 408976E 4525630N (WGS84/NAD83); and in the SW 1/4 of the NW 1/4, Section 28, T6N, R1E of the Humboldt Meridian. Browse the atlas shelves using the Library of Congress Classification System which arranges atlases geographically by continent. Use the Browsing Guide to Atlas and Map Call Numbers as a guide. Atlases are shelved in two separate areas depending upon their physical format--smaller atlases are shelved upright and larger atlases are shelved flat. Since the classification sequence is repeated twice you should browse in both areas. Search the HSU Library Catalog to find specific atlases. To find atlases covering a specific geographic area or subject--on the Advanced Search screen choose the "Location" Atlas and then do a keyword search using as keywords the geographic area, or subject in which you are interested. The Atlas Collection is a noncirculating reference collection. A few circulating atlases are located in the regular bookstacks on the second floor in the G 1000-G 3100 classification. Large-Scale Topographic Maps - See Topographic Maps for a description of available print maps, software programs and Internet accessible topographic maps. Road Maps and City Plans - See Road and Travel Maps for a description of available print and web maps. Maps are arranged in cabinets using the Library of Congress Classification System which arranges maps first by geographic area, then by subject, region, or political subdivision within the geographic area. One can browse the collection to see available maps using the Browsing Guide to Atlas and Map Call Numbers as a guide. Search in the HSU Library Catalog. While all maps are listed in catalog, many records only have brief entries containing mainly title and publisher information. The best way to search is to use the the Advanced Search screen; choose the "Location" Map Collection; and then do a keyword search using as keywords the geographic area, subject, and/or publisher in which you are interested. Begin by searching for the geographic area in which you are interested. If you do not find what you need using the specific geographic area, try a larger geographic area or series which may include the area (e.g., if you do not find what you need for California, try a United States series which includes California, or a world series which includes Ecuador). Many map titles are actually composed of multiple sheets that together form one "map" covering a large geographic area. Following are some of the major map series in the Map Collection. Other series are listed in the GIS and Digital Spatial Data guide. Consult the indexes to each series for available maps. Joint Operations Graphic (US National Imagery and Mapping Agency) (G 3200 s250 U5) Topographic map series at a scale of 1:250,000. Library has coverage mainly of Europe. See index in Map Filing Cabinet. Tactical Pilotage Chart (US National Imagery and Mapping Agency) (G 3201 P6 s500 U5) Aeronautical chart series at a scale of 1:500,000 showing topographic features by color relief and contouring. International Map of the World (G 3200 s1000 U5) Older series of 700 maps at a scale of 1:1,000,000 published by individual countries and coordinated by the United Nations. See index in Map Filing Cabinet. Americas--1:250,000 (G 3290 s250 P3) Map series at a scale of 1:250,000 published by individual Latin American countries and coordinated by the Pan American Institute of Geography and History. See index in Map Filing Cabinet. U.S.--1:250,000 (US Geological Survey) (G 3700 s250 U5--shelved in U.S. Documents) Series of 600 topographic maps covering all 50 states. U.S.--1:100,000 (US Geological Survey) (G 3700 s100 U5--shelved in U.S. Documents) Topographic map series covering the contiguous U.S.
U.S. National Parks and Monuments (US Geological Survey) (G 3701 G52 svar U5) Series of approximately 70 topographic or shaded relief national park maps. See index in Map Filing Cabinet. Nautical Charts (US National Ocean Service) (G 3701 P5 svar U5) Series of navigational charts of coastal and nearshore features. Library has coverage of the western states. See index in Map Filing Cabinet. Surface Management Status (US Bureau of Land Management) (G 3701 G51 s100 U5) Series of maps at a scale of 1:100,000 showing land ownership. See index on Map Display Panel. 1:100,000 Scale Metric Planimetric Maps (California Department of Forestry and Fire Protection) (G 4360 s100 C4) Series of planimetric maps at a scale of 1:100,000. Raised Relief Maps - 1:250,000 scale plastic raised relief maps for California are filed in drawers before California topographic maps. Humboldt County Collection. In this specialized collection are historical, topographic, and thematic maps of northwestern California. See Humboldt Room Map Collections for a description of major map collections as well as a searchable database. Maps of northwestern California which are part of a larger series., e.g., Soil-Vegetation Maps, are located in the main map collection. See also Maps - Northwestern California for a selected list of print and Internet maps. U.S. Geological Survey (Docs I 19) - specialized geologic and hydrologic maps; see Geologic Maps for more information on available series and indexes. The U.S. Government Publications Monthly Catalog indexes over 57,000 federal maps published from 1976 to the present. To search for maps choose the "Maps" format in the "Limit Search by: Format" option and then enter your geographic and/or subject keywords. Use the Index to Maps in Books and Periodicals (American Geographical Society) (ref G 1 A5) This is a subject and geographic index to over 200,000 maps published in books and periodicals from the 1800s to 1986. For maps published in books and periodicals from 1985 to 2005 see GeoBib: Online Geographical Bibliography. Search using the keyword "map" combined with a subject or geographical keyword. See the List of Geographical Atlases in the Library of Congress (Phillips & LeGear) 1969-1974 (9 volumes) (Docs LC 5.2:629) Lists 18,435 geographical atlases in the Library of Congress. Includes detailed indexes to individual plates and a cumulative author index. Search the WorldCat database which contains over 3 million records for maps and atlases. Limit the format to "map" and do a keyword search by subject and/or geographic area. Aerial photographs of northwestern California are located in the Humboldt Room. Available flights range in date from 1941 to 1983 at scales from 1:12,000 to 1:24,000. See Northwestern California Aerial Photography & Imagery for additional information on locally available aerial photography. For information on aerial photography and remote sensing resources in general see the "Imagery and Remote Sensing" section of the Geospatial Resources research guide.